Chris Penso kicked off Week 26 when New York City hosted D.C. United in Thursday night’s match-up. Just five more games make up the schedule, all of which take place on Saturday. Sorin Stoica is the man in charge of the day’s first kick-off, Vancouver Whitecaps hosting New York Red Bulls at BC Place. The Red Bulls were involved in our recent Play of the Week, in which PRO’s Paul Rejer looked at AR priorities and the skill of multitasking. Half an hour later, at 7:30pm ET, MLS Referee of the Year Alan Kelly takes the whistle for New England Revolution versus Colorado Rapids at Gillette Stadium. For support, he has the three Js – Joe, James and Jaime. Fletcher and Conlee are the ARs, while Herrera is on fourth official duties. Revolution are in US Open Cup Final action in two weeks’ time, where they’ll face FC Dallas – a team also at home in Week 26. Toros take on Portland Timbers with Ted Unkel as center referee. 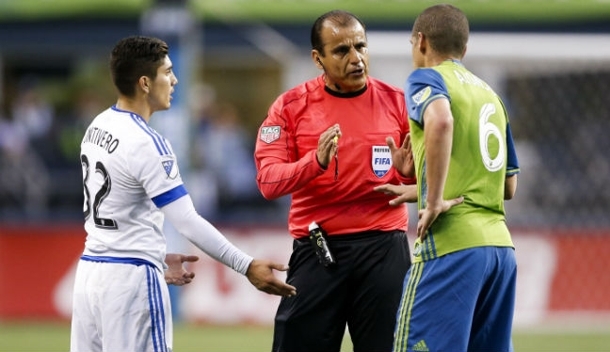 Baldomero Toledo, who will referee the Final in Houston, also takes to the field – he will oversee Chicago Fire against Philadelphia Union. The final game of the week kicks off at 10:30pm ET, when Kevin Stott blows his whistle for Los Angeles Galaxy versus Columbus Crew.